I'd like to share my most recent commission, a scabbard for a Christian Fletcher Borderwatch sword. This one was mocked up artistically by the client, and I made it come to life. It's very close to the original draft, and I'm really pleased with the results. The suspension is left incomplete intentionally as it will only be a display piece in the client's display room. Comments, questions are welcome and thanks for looking! I love that scabbard, it makes me think of Gondorian rangers from LotR. Wow Brian! That truly looks great and goes perfect with the CF Borderwatch! The White Tree of Gondor and leaves really pop on this. By chance do you have the sketches the client sent to see how close you came? Knowing your level or work I would guess pretty close to spot on! That tooling is outrageous! What a knockout. Another great scabbard Brian! +1! I need to stop buying bikes long enough to buy a sword so that I can have you make me another scabbard Brian. I used to wonder why in today's world folks would spend so much on a scabbard...you have definitely answered that question. You surpass the term "scabbard" into a work of fine art. Your work seriously keeps on being more and more amazing. Stunning. Just stunning. 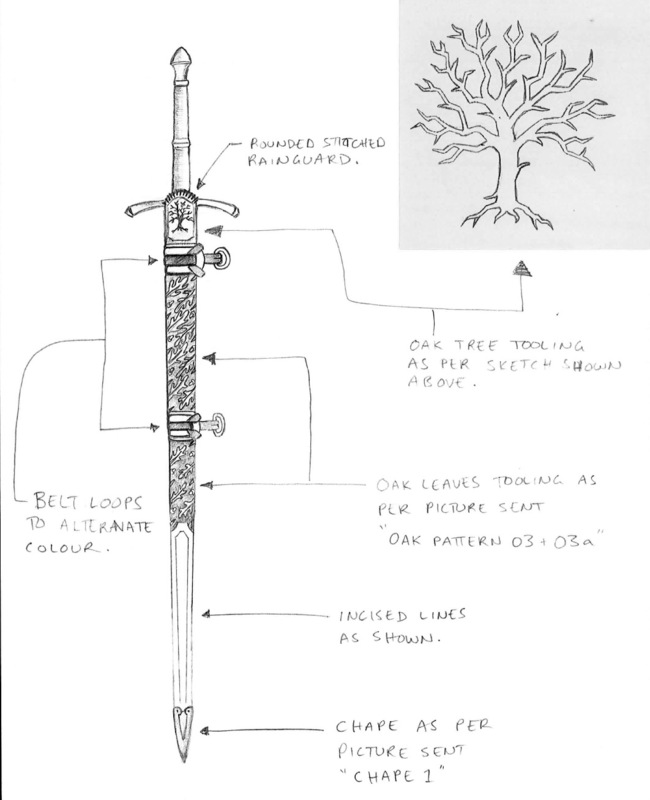 That is truly a work of art and it has made me re-think my expectations of a scabbard! Absolutely incredible, as always Brian! This is one of my favorite yet.